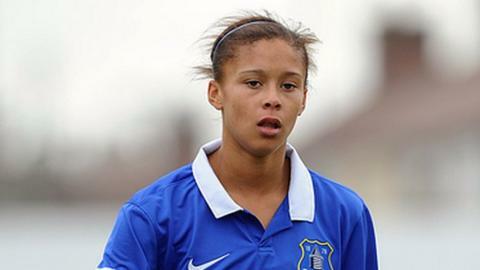 Women's Super League Two leaders Doncaster Rovers Belles let a 2-0 goal lead slip in a 3-3 draw with Everton. Kasia Lipka and Courtney Sweetman-Kirk put Belles in front before Chantelle Boye-Hlorkah pulled one back for the visitors with 14 minutes remaining. Sweetman-Kirk's second goal of the game then restored Doncaster's advantage. However, two goals in the final five minutes from Ellie Stewart and Boye-Hlorkah saw Everton claim a point and keep their own promotion hopes alive. Despite Doncaster's second consecutive league draw, if Yeovil lose at home to Everton this weekend, then Belles can clinch promotion with victory against London Bees on 27 September. Doncaster midfielder Lipka said that while the draw was frustrating, the team were confident about regaining a place in WSL1. "We're still top of the league, so we feel there's nothing really to worry about," she added. "We've just got to push on, there's only a few games left, we just have to keep the performances high."